Suicide is the act of taking one's own life on purpose. Suicidal behavior is any action that could cause a person to die, such as taking a drug overdose or crashing a car on purpose. While men are more likely than women to die by suicide, women are twice as likely to attempt suicide. Most suicide attempts do not result in death. Many of these attempts are done in a way that makes rescue possible. These attempts are often a cry for help. 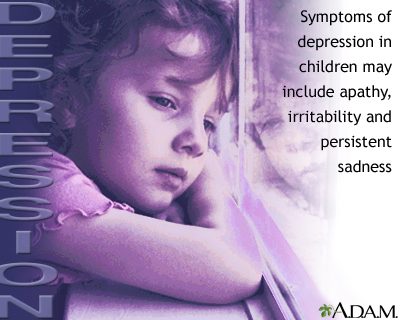 Some people attempt suicide in a way that is less likely to be fatal, such as poisoning or overdose. Men are more likely to choose violent methods, such as shooting themselves. As a result, suicide attempts by men are more likely to result in death. Relatives of people who attempt or complete suicide often blame themselves or become very angry. They may see the suicide attempt as selfish. However, people who attempt suicide often mistakenly believe that they are doing their friends and relatives a favor by taking themselves out of the world. Talking about going away or the need to "get my affairs in order"
A person may need emergency treatment after a suicide attempt. They may need first aid, CPR, or more intensive treatments. People who try to take their own life may need to stay in a hospital for treatment and to reduce the risk of future attempts. Therapy is one of the most important parts of treatment. Always take suicide attempts and threats seriously. If you or someone you know is thinking about suicide, you can call the National Suicide Prevention Lifeline at 1-800-273-8255 (1-800-273-TALK), where you can receive free and confidential support anytime day or night. Call the local emergency number (such as 911) right away if someone you know has attempted suicide. DO NOT leave the person alone, even after you have called for help. About one-third of people who try to take their own life will try again within 1 year. About 10% of people who make threats or try to take their own life will eventually kill themselves. Call a health care provider right away if you or someone you know is having thoughts of suicide. The person needs mental health care right away. DO NOT dismiss the person as just trying to get attention. Avoiding alcohol and drugs (other than prescribed medicines) can reduce the risk of suicide. Keep all prescription medicines high up and locked. DO NOT keep alcohol in the home, or keep it locked up. DO NOT keep guns in the home. If you do keep guns in the home, lock them and keep the bullets separate. In older adults, further investigate feelings of hopelessness, being a burden, and not belonging. Many people who try to take their own life talk about it before making the attempt. Sometimes, just talking to someone who cares and who does not judge them is enough to reduce the risk of suicide. However, if you are a friend, family member, or you know someone who you think may attempt suicide, never try to manage the problem on your own. Seek help. Suicide prevention centers have telephone "hotline" services. Never ignore a suicide threat or attempted suicide. Brendel RW, Brezing CA, Lagomasino IT, Perlis RH, Stern TA. The suicidal patient. In: Stern TA, Fava M, Wilens TE, Rosenbaum JF, eds. Massachusetts General Hospital Comprehensive Clinical Psychiatry. 2nd ed. Philadelphia, PA: Elsevier; 2016:chap 53. DeMaso DR, Walter HJ, Wharff EA. Suicide and attempted suicide. In: Kliegman RM, Stanton BF, St. Geme JW, Schor NF, eds. Nelson Textbook of Pediatrics. 20th ed. Philadelphia, PA: Elsevier; 2016:chap 27. 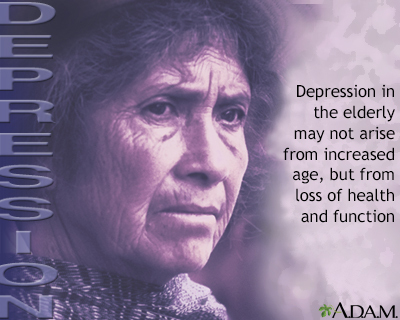 The elderly are at high risk for depression because they are more likely than younger people to have experienced illness, death of loved ones, impaired function and loss of independence. The cumulative effect of negative life experiences may be overwhelming to an older person.